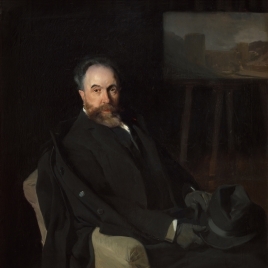 Sorolla was the most gifted Spanish painter of his generation, excelling in portraiture. In the early years of the twentieth century, and especially after the encouragement of winning the Grand Prize in the 1900 Exposition Universelle Paris, he demonstrated the influence of Velázquez through the use of long, confident brushstrokes. This portrait of María de Figueroa y Bermejillo -the daughter of Rodrigo de Figueroa y Torres, Marquis of Gauna and later Duke of Tovar, and Emilia Bermejillo y Martínez Negrete, a lady-in-waiting to the queen and a lady of the Maestranza (cavalry armoury) of Granada- is a clear homage to the portrait of the infanta Margarita that Sorolla admired in the Prado, a painting that was thought initially to be by Velázquez but was subsequently attributed to his son-in-law, Juan Bautista Martínez del Mazo. The evocative power of Mazo´s portrait led to numerous pictorial and poetic homages, such as the sonnet La infanta Margarita, by Manuel Machado, from 1910, which begins: Como una flor clorótica el semblante, que hábil pincel tiñó de leche y fresa, emerge del pomposo guardainfante, entre sus galas cortesanas presa. (Her face like a pale flower, which a skilful brush has tinged with milk and strawberry, she emerges from her majestic petticoat, held captive by her courtly finery. 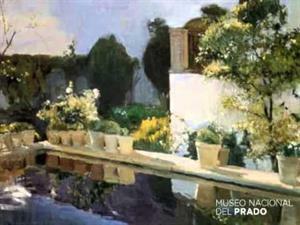 )In Sorolla´s painting, the little girl appears dressed like Mazo´s infanta. 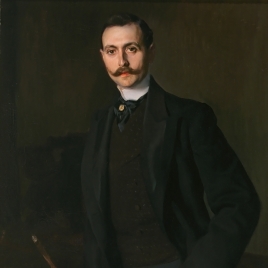 Portraits inspired by figures from the Golden Age were common in Spain during the nineteenth century. They were also frequent in the masques that the members of high society attended, with care given to costume and comportment alike. At such events, the participants would stage tableaux vivants that imitated the compositions of wellknown artists. The Figueroas were friends of Manuel Yturbe, a wealthy Basque emigrant to Mexico whose fetes were renowned for their elegance. The daughter of Yturbes, Piedita, was celebrated for appearing at a ball in March 1900 dressed as the infanta Margarita. The tableau in which she appeared was directed by José Moreno Carbonero, who painted a portrait of Piedita dressed in the same costume, which he presented at the National Exhibition of Fine Arts the following year. The idea to have his own daughter, María, painted in the same dress may have occurred to Figueroa at that ball.Although the pose and the model that provided the point of reference are the same, Sorolla´s execution of this painting, based on broad brushstrokes, is diametrically opposed to Moreno Carbonero´s minute attention to detail. The portrait was sketched and executed in a single session, except for the head, which is more developed and anchors the image of the girl. Her body, in contrast, is amplified by the petticoat, which conceals the girl´s feet, as in Mazo´s portrait of the infanta, and fills the entire width of the canvas. The sketchy state of the petticoat, the puffed sleeves and the absence of any clear indication of her hands (though the left hand is sketched, along with the handkerchief she holds) all contribute to the sensation that the figure is floating. In contrast, the tight-fitting bodice defines her with clarity.The artist has skilfully captured the essential features of the little girl by means of a direct, prolonged brushstroke. The loose brushwork in very liquid paint leaves part of the canvas exposed. With a limited but brilliant palette -especially in the deft use of rose tones, the white highlights and the silvery sheen- he has given the figure a great sense of liveliness, particularly in contrast with the brown and darkred background, which he has executed in agile brushstrokes. 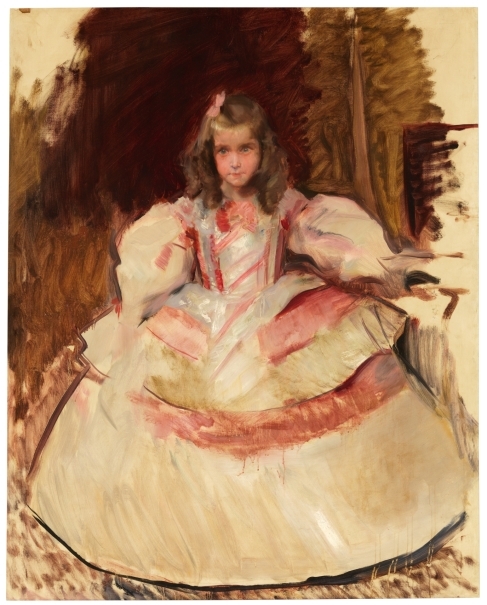 As a result, the image, which has the girl placed frontally as the central axis of the painting, does not produce a sense of stasis, even though she is motionless.Despite its unfinished state, the painting proves to be one of the most explicit and successful homages to the Spanish Golden Age from Sorolla´s time (Barón, J.: Portrait of Spain. Masterpieces from the Prado, Queensland Art Gallery-Art Exhibitions Australia, 2012, p. 262 ). Height: 151.5 cm. ; Width: 121 cm. Rodrigo de Figueroa y Torres, I Duke of Tovar; María Figueroa Bermejillo; Rafael Figueroa Bermejillo; Private Collection, Madrid; acquisition for the Prado Museum, 2001.